Prima Traveler's Journal Decorative Tape 3/Pkg - Perfect for adding fun designs to scrapbook pages, cards and other paper crafting projects! 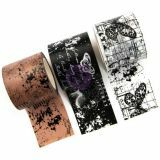 This package contains three 10 yard rolls of 1.375 inch wide tape in assorted designs. Imported.